Before writing this article, I searched financial unrest to see what was written on this topic and nothing even closely related to this serious financial condition came up. It seems that somehow no one talks about this and it is one of the most dangerous financial times any of us will ever experience. There are financial articles on virtually any topic, but the one that I see ruining people’s financial lives time after time is noticeably absent. Like many of our clients, you may have experienced this feeling once before, once a year or once in a lifetime. This condition begins with a realization that you have more money than you planned on having at the given moment. Perhaps you got a bonus, an inheritance or just kept your nose down and saved until a sum of money appeared in your bank account and altered your sense of sensibilities. A feeling overtakes your mind suddenly as you dream of spending, and spending uncharacteristically big, as the urge to find a “cash equilibrium” supersedes reliable spending habits. Let’s talk about the most destructive financial force you never even heard of because it’s being named here for the first time – FINANCIAL UNREST! Let me provide some recent examples from just the past few weeks to lay the foundation of financial unrest. A client of ours earns a nice living, saves dutifully in her retirement accounts and saves according to her plan. Well, her company experienced a great year with record profitability. She was recognized as helping contribute to the company’s success and received a deluge of bonus payments none of us expected. The best way to explain this is that she suddenly felt richer, started to dream of how to spend the new windfall and ended up looking to buy a second home in the already stretched real estate market of the Northwest. Her rationale was that she was, in fact, investing her cash; she was just doing it in real estate – even though she is buying near all time highs and not renting out the property for income. Another client inherited money from a deceased family member and then suddenly decided to push up the long-term career goal of owning a home on the beach from before he died to right now. The home purchase was done under the guise of living out a lifelong dream. The big message was “you only live once.” Well, I start to wonder, what if you live long? A third client owns a nice business in family entertainment and enjoyed a profitable 2017. 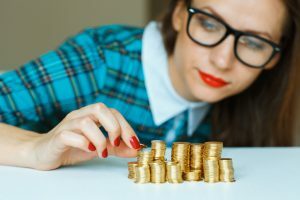 Rather than reinvesting in the business, or building up a safety net and financial cushion, a new desire to spend his windfall stirred within his bones. He started looking at new very expensive trucks, or putting additional funds into his family home. Before the cash hit his account, his house was fine and served his family well. Suddenly, once he looked at his girthy account balances in the bank, his mind started wandering to the possibilities. After writing these down, I am struck by how financial unrest is not discussed more often. It’s crazy. According to www.tradingeconomics.com, nearly 70% of our U.S. economy is based on consumer spending and largely determines how much we grow domestically. So, we appreciate when people are confident and go out and spend because largely it moves the economy forward. As much as our economy might grow with everyone spending like crazy, we promote living within your means and planning on saving versus spending. Let’s examine these three cases to see what could have happened – a financial version of the Ghosts of Christmas Past, if you will. Let’s see how the people above changed their financial lives long-term with these quick decisions. This client ended up buying a home in the Northwest for $700,000 and put down $250,000 while taking a mortgage out on the rest. The new mortgage put a financial burden on her that she didn’t have before. Let’s hope her income stays at this unusually high level because if her bonus goes down in the future, she won’t be able to cover the second mortgage on the house and she lost the growth on $250,000 for the future. Yes, the house in the Northwest hopefully will grow in value, but if she bought high, it could take her a decade to break even. Plus, the cost of keeping this house up, real estate taxes and the pressure of a second home make this a challenging financial situation. In all, this purchase may add as much as seven years of additional work to her retirement age, which looked like it may drastically change her financial plan. Her plan was designed for retirement at 58. Now she may have to work up to the age of 65 because of this purchase and increased risk/exposure. The second client bought a house on the beach for $2,000,000. It’s quite likely that additional money will be spent on future upgrades over time because what people routinely forget is the real depreciation on beach houses is far greater than the norm because houses wear out quicker due to more extreme weather conditions. So, with this inheritance gone, he went from being able to retire in five years to making his retirement an event that he may be able to achieve in 16 years. Eleven years of work will feel like an eternity at some point. I am sure, like the Ghost of Christmas Past, this decision could come back to haunt the family, especially if he purchased the house at market highs and ends up putting a lot of money into keeping the house in great condition. The third client ended up spending $150,000 fixing up both his kitchen and master bathroom that suddenly felt unlivable now that he experienced financial unrest. Those dollars may have increased the value for resale, but he isn’t selling because he loves his neighborhood and the school his children attend. By the time they attempt to sell the house years from now, the updates may be outdated, worn down and out of favor. If he invested the $150,000 and earned 6% over the next 20 years, he might have accumulated an additional $481,000 in his investment accounts, and if that happened, would dramatically improve their long-term plan. Yes, there is value in getting out there to live your best life, but be wary of financial unrest. It is real and pushes you toward making substantial investment decisions that might change your family’s financial life forever.